(2013 Treasure Hunt) Shimmer discovers her inheritance as a rockshaper. Ed. Note: Shimmer was the cubname of Starskimmer. �You opened it,� Agate�s voice was stiff with complex emotion: surprised dismay mingled with a little motherly pride, as she stood in the doorway of her den. Before her, Shimmer sat cradling an ornately shaped stone box, its contents littering the floor at her feet. Shimmer looked startled and a little guilty at being caught red-handed by her mother. �I, uh,� Shimmer stammered, not knowing what to say. But what was there but the truth? **I wanted to know what was inside** she sent. ** It�s such a lovely box but you never ever open it and I knew I could do it on my own, since my powers came in and I just couldn�t resist...** She cast her eyes downward, apologetically. �Shh, shh,� Agate hushed her daughter as she moved to sit down beside her. She extended her hand for the box which Shimmer promptly delivered. The dark-haired elf quietly examined the stone container while her green-eyed progeny watched nervously. Had she done something wrong? Was it damaged? She had been so careful while trying to pry it open, gently coaxing a seam to appear around the edge which had deepened until the box split open like a shucked oyster. The contents had erupted all over the floor mere moments before Agate had returned so unexpectedly. �Collection? 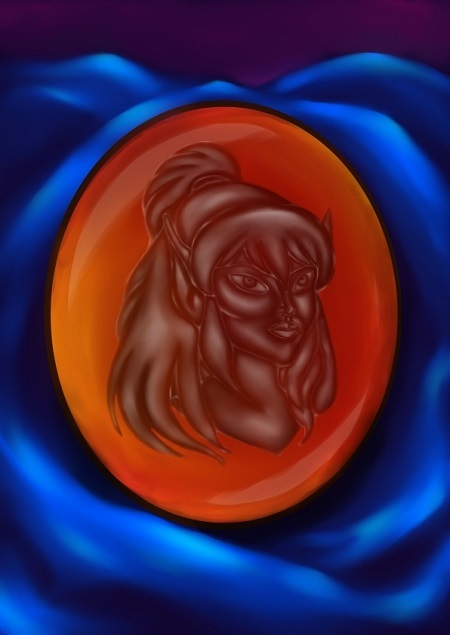 What...?� Shimmer looked down at the baubles at her feet, most of which appeared to be shaped-stone jewelry. She picked up an especially large hunk of red agate and discovered a portrait had been cut into it. The elf staring back at her was vaguely familiar and Shimmer found herself struggling to put a name to the face. **Knifemaker** her mother sent, supplying a more vivid image of their red-haired Ancestor. **She is your many-times grandmother, on both your father�s and my sides of the family. Mated to Clayshard, the first rockshaper among us. It was he that shaped her likeness into that gem after her death, as a memento. ** There was a note of sadness at the loss in her mind-touch. Shimmer marveled at the skill of her ancestor, turning the carved gem this way and that in the light of the single candle in the den. Clayshard must have chosen the red agate to be evocative of Knifemaker�s vibrant red hair. The surface was perfectly smooth and highly polished aside from where the portrait was indented into the stone. She went to put the gem back on the wooden floor but Agate�s hand intercepted it and carefully stored it back in the box. Shimmer now noticed that the box�s interior was filled with a deep blue silken lining. She couldn�t resist stroking a finger delicately along the material, luxuriating in the smoothness of the fabric. No wonder the gem�s polish was so well-intact. �Here,� her mother said, plucking another treasure from the floor and depositing it into Shimmer�s lap. The young rockshaper lifted the piece up and giggled. �It�s Stoneback!� Shimmer chuckled as she turned over the granite figurine of her grandsire in her hand, a very literal interpretation of his name it was too. There he was, in all his grinning furry-faced glory with a great big (comparatively) shaped boulder resting on his muscled back. �I made that, not long after he passed. I�m glad to share it with you now,� Agate smiled, and again Shimmer noted a little sadness in her tone. For the next little while, mother and daughter picked through the collection of treasures, Agate sharing little anecdotes about each piece as they carefully laid them back into their special box. There were more cameo and intaglio portraits, figurines and exquisite jewelry carved in ways to suggest the names of various ancestors and their loved ones. Then Shimmer scooped up a small chip of purplish banded agate. There was no image carved on it, but rather the bands seemed to have been arranged in the silhouette of some type of plant, a bush or bramble of some kind. Bramble. It was then that Shimmer was struck by the import of just how special this collection must be. �Hmm?� Agate responded, setting down a string of jade beads into the box and giving her daughter her full attention. �Is this... supposed to represent my sister?� Shimmer produced the chip for her mother to inspect. Agate let out a small gasp and gingerly took up the little piece of stone. She stared at it for a long moment before closing her eyes in a futile effort to hold back the tears that had been threatening to spill for some time now. They fell slowly and silently while Shimmer hovered over her mother, unsure how to offer comfort. Shimmer nodded her understanding. �Everything in this collection, they�re all mementos of the dead,� she stated somberly. �Not a very cheerful inheritance, is it? And you wondered why I never open it.� Agate rubbed at her eyes and cheeks with her left hand, still grasping the agate chip in her right. �So... will you tell me about it?� the young elf lass prompted, her eyes flicking towards the purple stone piece. �Would you like to try again, now, together this time?� Shimmer asked, eager for a chance to work her magic under her mother�s tutelage, as well as to remember the sister she had never known. And so mother and daughter, the tribe�s only rockshapers, bent over a task that only they could do. Through the waning hours of night and well into daylight they worked, until at last a beautiful purple pendant lay before them, one side smooth and banded in the likeness of a bramble bush, the other a raised cameo portrait of a mischievously smiling Bramble, the elf. Shimmer was exhausted from her toil, having never before pushed her powers to such a level of detail. She had acquired a great deal of respect for her mother�s abilities as a rockshaper that evening, for it was evident that they quite outstripped her own. �Well, that�s that,� Agate sighed, moving to place the finished piece within the Tear Box. Agate smiled and said, �Yes, you�re right. I think he would like that,� even though a part of her wondered if Dagger would appreciate the gesture. Bramble�s death was still a sore spot between them, even after all these years. But she didn�t want to say as much to Shimmer, not now. �And mama, would it be all right if I wore it, here in the den? Just this once... it seems a shame to make it so beautiful and not even wear it once...� Shimmer�s words trailed off into a yawn. Agate responded by tying it around her daughter�s neck with a leather thong. Shimmer cupped the pendant in her hand, admiring their creation until finally sleep claimed her. Agate sat by her side, stroking Shimmer�s long brown hair and brushing her bangs from her face. In a weird way, looking down at the sleeping elf and Bramble�s cameo portrait, it was if she had both daughters together for the first time. She wondered if Bramble�s spirit lurked nearby, and if she approved of their efforts. She hoped so.